The power transportation car for agriculture is convenient and easy-to-use to do the labour for farming. The transportation car has various one like the crawler type, three-wheel type, and four-wheel type, etc.It is the one to be used properly according to the usage. Agriculture..for..power..transportation..car..How to use..maintenance..think. The feature of the power transportation car and How to use. 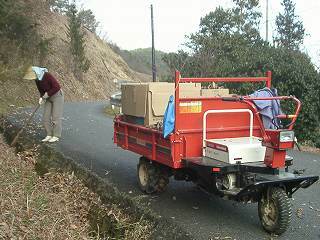 This photograph is a power transportation car of three wheels of Yanmar that I am using. The maximum payload is 600kg. The rear wheel is a double tire. The carrier goes up by the oil pressure like the dump truck. This photograph collects fallen leaves collected in the roadside and the street gutter. Fallen leaves will be collected in winter, it puts in the rice field, and it makes it to the fertilizer. The power transportation car is very convenient for the work that collects while changing the place like this and turns. This power transportation car is very convenient also for the transportation of earth and sand. When earth and sand is unloaded, the one that the carrier goes up by the oil pressure like the dump truck is especially convenient. If it is not so, it is necessary to unload with the shovel little by little. It also has the one of the crawler type besides this in the transportation car. It is convenient that the crawler type runs in the [nukarunda] rice field by the one to run in Caterpillar. However, the speed doesn't go out so much. It is checked whether each part is seen before the engine of the transportation car is started and abnormality exists. It is checked whether the air pressure in the tires is suitable. It makes it to the position (start position) in which the accelerator lever was pulled from low speed a little. The clutch lever is made in the state of cutting and the brake lever is adjusted to the position in which the brake hangs. When the engine starts, it is low-speed and warm-up [shimasu] for 2-3 minutes. It gets on the operating step. The clutch on which it steps by the foot is cut, and it steps on the brake on which it steps by the foot. The clutch lever is made in the state of entering and the brake lever is adjusted to the position in which the brake doesn't hang. The gear-shift is made low-speed. The accelerator, the clutch, the brake, and the gear-shift are used well just like the car and it drives. Clothes wear long-sleeved shirts and long trousers, and wear the hat and gloves without fail. The purpose of this is to protect the body. Do not use a power transportation car passenger use on the road of the rapid inclination because it is dangerous. In this case, the transportation car of the crawler type is used. When running in the public road by passenger use power transportation car, it is necessary to deliver to the municipality public office and to get the numberplate. It is necessary to license the small sized special vehicle. It is necessary to join the compulsory automobile liability insurance. When storing it without using the power transportation car for a long term, gasoline in the fuel tank is pulled out. The fuel of the float is pulled out. The engine doesn't often hang when using it next if this is not especially noted in two-cycle engine.